When you first look at IK Multimedia’s iLoud Micro Monitors, you might think that they’re too small to deliver big sound, or deliver clean sound without distortion in the low to mid-range due to their size. So, we gave them to the most trusted and famous ears in pro-audio history and editorial to test them out for “ACTUAL” feed back, and…”This is the one time where a product defies the laws of physics.” ~ Craig Anderton of Harmony-Central.com on iLoud Micro Monitor. Click here for the full review. 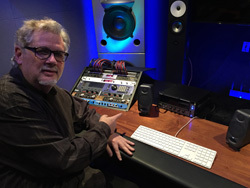 Learn more about Dave Pensado and Pensado’s Place, click here to visit his website. Stay tuned to IK Multimedia and Pensado’s Place for more information and events concerning iLoud Micro Monitors. For more information about IK Multimedia’s iLoud Micro Monitors, please visit the IK product page and website, here, for more editorial reviews and quotes from engineers and artists. The iRig HD 2 from IK Multimedia gives guitarists/bassists, and anyone with a quarter inch input the ability to record and perform live with their new iPhone 7, iPad, Mac and PC. iPhone enthusiasts will be happy to know, that a ton of IK Multimedia products for broadcasting and recording that use the headphone output will still work with Apple’s included headphone jack adapter (that comes included in the iPhone 7 packaging). USA’s Top Tech Reporters Spotted Capturing Apple’s Event with iKlip A/V! “This is the reality of local TV. We do our own stuff, so we’re recording live right now.” says KTLA’s #1 Tech reporter, Rich DeMuro, as he holds his iPhone connected to an iKlip A/V while shooting Jefferson Graham and Ed Baig from USA Today walking up to greet him. Jefferson remarks that he’s impressed with the IK Multimedia video rig he has, and they make some jokes about not being excited for the event, though they clearly are. Apple’s Annual September Announcement event is highly televised, streamed, reported on and watched by millions of tech enthusiasts and broadcasters. KTLA’s Rich Demuro was using his iPhone and iKlip A/V to capture high resolution video and audio, and he was spotted by USA Today’s Jefferson Graham, who always uses IK’s iRig Mic HD and other IK products for his recordings in the field. Check out the candid video of them running into each other right before the highly anticipated Apple announcement event for 2016, (iPhone cameras rolling). Here is the video Rich Demuro shot with his iPhone and iKlip A/V from Apple’s event covering iPhone 7, which aired live on national TV. To learn more about KTLA’s Rich Demuro and the iKlip A/V feature, please watch the featured video..
Record your next video with iKlip A/V. How do I connect my guitar, microphone or MIDI controller to my iPhone, iPad, Android or computer to record or make music? There are so many options these days to make computer music….you can use your iPhone, iPad, iPod touch, or Mac/PC with your organic instruments (like a guitar or your own vocals). Software for music producers on Mac/PC that used to cost on the ups of $500, are now available on the iTunes App Store for $20 and even less/free. But the question always remains, how to do I connect my guitar or microphone to my mobile device or computer so I can make music and record audio? iRig HD ($99) from IK Multimedia. Grab a 1/4 inch cable and plug that bad boy into the iRig HD, then into your Mac/PC, or iPhone, iPad or iPod touch. Then use a guitar/bass amplification/recording application like AmpliTube (available for free to start on all platforms). Coming soon…the iRig HD 2! Stay tuned to IK Multimedia for the new edition! Same as above, except for Android and PC users. The iRig UA will definitely take the latency out of your little toaster sized CPU tablet or phone. iRig PRO ($150) from IK Multimedia. This little gem of an interface will support your guitar & bass (1/4 inch), has XLR for a microphone input for vocals, and also serves up a MIDI hookup for your keyboard controller. All-in-one. Works on all platforms (iOS + Mac/PC) 24-bit/96K sample rate. iRig Pro DUO ($199) The first truly mobile, dual channel interface for all platforms. Two channels of 1/4 inch, XLR and MIDI for your recording pleasure. Plug in a guitar and a mic, and also your MIDI controller to perform live or record your next masterpiece, with 24-bit/48K sample rate. iRig MIDI 2 ($79): this interface will allow you to hook up several MIDI controllers at a time to work with your iPhone, iPad, iPod touch, Android or Mac/PC. iRig Mic Cast ($39) Nifty little unidirectional mic that works perfectly for Skype, Facetime, Voice Memos, Snapchats, Video messaging and more. iRig Voice ($39) Karaoke Mic for beginners. Cute iPhone 5C colors, great gift for the future vocalist in your family. iRig Mic ($59) Inexpensive electret-condenser mic that works everywhere, has great sound and won’t kill your pocket. iRig PRE ($49) – Plug any XLR mic into your mobile device or tablet and have phantom power as well (Condenser mics need this) Then use your own expensive microphone and record whatever you need to. iRig Mic Lav ($79)- awesome lavalier mic setup! Can plug in two at a time (daisy-chain) so you can conduct interviews with your mobile device. Omni-directional, great for broadcasts and situations where you want to enhance your audio, and not the background noise. iRig Mic Field ($99) Great stereo field mic for recording outside or indoor concert venues. No more snap, crackle, pop on your videos, Snapchats, or Periscope broadcasts! iRig Mic HD ($129) Widely used condenser mic for broadcasting, live performances and interviews. iRig Mic HD-A ($129) – Same as iRig Mic HD, just a condenser mic for Android/PC users. iRig Mic Studio ($179) Super sensitive, 1-inch large diaphragm condenser microphone that will work with iPhone, iPad, iPod touch, Android and Mac/PC. Perfect for studio-quality vocals and acoustic guitar recordings. Also has 135 DB SPL (so you can mic a drum kit with it!!!) 24 bit/48k sample rate. I particularly liked this one woman’s tarot reading (well, two actually), so I started listening to them more than the others. So, on both, I left kind messages on their comments’s section to thank them for the readings (never did that before). I recieved a kind reply from one of them, YouTube.com/YourIndigoPath. Somehow I felt drawn to ask her for a personal reading, and she agreed to it. We made a plan to Skype for the reading (I believe truly that sincerity is in the eyes). I wanted to share my experience with my readers, so that you may decide for yourself and be aware of what’s truly out there in the land of mediumship / psychics / fortune telling/ tarot card readers. What is mediumship? Mediumship is the practice of certain people—known as mediums—to purportedly mediate communication between spirits of the dead and living human beings. (Sidenote – there are a lot of real people who can do this type of work, and there are TONS of frauds in the business…When I was a small child, my family rented out a space to one of the most famous “gypsy” clans in NJ – Gifted Sara’s team, and Gifted Sara and her kin are the real deal. Unfortunately, years later, even they had someone working for them at one time (freelance, I guess), who was a total fraud. If you are interested to know which one of her “psychic” tarot readers was the fraud, you are welcome to email me. Although, I don’t think she would be working there anymore anyway…there has to be more people than just me that thought she was a fake and a total fraud. We made a plan to Skype, and I didn’t tell her anything about my life. Because I’m sort of a public figure, she could probably tell I’m a musician and supporter of musicians, but that’s about it. After settling in with polite hellos, she was going to read my tarot…I wanted a love tarot reading (of course! ), but almost immediately we started having strange technical difficulty (delays in Skype, lag in video) and pretty much the first thing she said to me was that there were a lot of people chattering at the same time, wanting to talk to me. I didn’t know at the time that she was also a medium. So when she said there were people wanting to talk to me, I was surprised to know just “who” these people were (and were they physically there?). She told me that there were three women (spirits) in the room that were jumping at the bit to talk to me. So she asked me if I wanted to speak to them. Even though I wasn’t prepared for it, I agreed. I thought for sure that this would really tell me if she was the real deal or not. After we agreed to it, she told me that the spirits in the room decided to give one woman the space and made the other ones quiet down. Suddenly, the interference calmed down on the Skype. It was still there to a degree, but oddly noticeable that the audio was coming through a lot easier, and I wasn’t receiving a delay in speech vs talk on the video. She asked me who the woman was with the curly blond hair, who she said “was obviously in charge” and wanted to talk to me the most. I said I didn’t know at first (even though I thought it might be my grandmother who had just passed three years ago). Cindy didn’t really ask me any questions, she just started telling me that my grandmother was okay and that they were all “together now” and really missed me. She said a lot of things…but at the time they seemed pretty much like something that anyone could say to you if they were missing you. So I asked a specific question to make sure this was my grandmother, I asked her to tell me what I was doing when I would say, “Grandmom, what is going on in the world?”. Then the interference in the video/audio on Skype became very agitated…it was like they knew I was believing and the spirits that were there all wanted to talk to me at the same time. Meanwhile, remember, I thought I was just getting a personal tarot reading, I wasn’t ready for all of this…. So here’s the story, we spent the next 4 hours talking to these three spirits (who were my mother, my Aunt Carmie and my Grandmother. Millie Natale). Cindy also did a tarot reading, because I asked about how my vacation was going to go (first vacation I have taken in five years that didn’t have to do with a funeral) This all came true as well. The vacation went exactly as she said it would, that I would be spending it alone, mostly, and that all of my plans would not go the way I had scheduled them, and that even if there were promises made…that they would be broken. Mostly, she told me that there was someone in my life that was constantly lying to me, and that my family knew it, and everyone else around me knew it, and that I just had to get away from this person before I ended up drowning in a sea of tears. She followed up with a complete tarot reading, which also blew my mind…because all of that came true as well. I would ask a question, and she would answer with tarot spread, then further clarify by placing more tarot cards on the table and being specific about her answers. Overall: Mind Blown. It’s been over two months now and everything came to fruition. If you want a personal reading from Cindy/ Your Indigo Path on YouTube don’t hesitate to do it. Here are her details on pricing from her website, www.YourIndigoPath.com: If they have changed somewhat, it may mean that’s she’s having a special for the holidays, or they just changed because she’s becoming more popular! 1) 1 question 3 card pull- 10 min each- $20.00 with this it is one question and I will see what the cards say for past, present and future. This is for each question so to clarify you may want two questions and then donation I ask is $20.00 per question per 10 min. 2) 30 min Celtic spread- $60- This is the version you’ve seen on my video. This covers one area of your life ie. Love, Career or Finances. 3) 30 to 40 min Life Spread- $120 this covers all aspects of your life ie. home, career, relationship, finances and future. It is also more detailed. My suggestion is: Please visit Cindy’s/ Your Indigo Path’s – YouTube channel, subscribe, and watch some videos for your zodiac sign. Then if you have a life event, hit her up for a personal reading. You won’t be disappointed! Jefferson Graham, technical editor for USA Today, is also a great musician! He plays guitar, bass, keys and he can even sing! So when I asked him to come visit IK Multimedia’s headquarters in Modena, Italy, he agreed! Check out the video of Jefferson Graham, taking a look behind the scenes at what it takes to make music in the 21st century…from iOS & Android music creation, to app innovation to pro-audio mass production of software and hardware in the motherland of music. Here is the video from USA Today’s feature “Making digital music in Italy with IK Multimedia”. To watch the video, click on the image below, or click here.